“I’m done!” I internally screamed, my heart beating with vehemence. As some teenagers do, I then proceeded to turn my music up probably a little bit too loudly. What can I do? So why not just sit here and listen to music probably a little bit too loudly? Did you know that there are people who are literally dying on the streets of hunger, illness, and are being abused within an inch of their lives and then expected to put a full day of work in? Did you know there are children younger then my kid brothers who are being sold into slavery? Which is frustrating, because really what can I do? I would love to just fix the whole thing. But it’s not that easy. There are kids my age who are making choices every day– both for good and for evil. I would love to talk to all the kids who are making stupid choices and just tell them about about Jesus and the amazing life that he gives, but let’s be honest, would they listen to me? Probably not. Which creates more frustrating problems. Because really, what can I do? It’s a messy world. The chaos that is going on everywhere isn’t getting any less messy. I wish I could just press this magic button. A sort of “Clear all” or “Escape” key and then everything could just be perfect. I mean here I am, just sitting here being, like, a normal teenager in the midst of all this insanity. Here I am just watching the world fall apart and doing nothing but listening to really loud music and banging away on the poor abused keys of my laptop. It’s so hard to realize that there is nothing I can do. There is no magic button, magic speech, no blog post I could write that could change the world. The truth of the matter is I can only be in instrument of that God uses to fix it. I can only point and lead people to Jesus. Which… is actually really hard. It means that you have to trust in him unconditionally. It means you have to surrender to whatever he asks you to do and that you have to fix your eyes on Him even though the road is narrow and the world is exploding everywhere. It’s not easy. Not easy at all. It’s not easy to keep being hopeful even when everything is crashing in. It’s not easy to believe that God is forever sovereign. It’s not easy to trust in His unfailing love and that He has a plan that is for our good. I know that bad things happen. I also know that the world is messed up because of this ugly thing called sin. But we have hope. Jesus told us we would have trouble – in fact that’s why He died for us. He died to overcome the insanity of this world. He died to break the power of sin and death. He died to give us peace and grace and His Holy Rest. So that we can stand strong and lead people to Him and His rest. Sure, it’s gonna be hard. It’s hard to think about the people who are younger then my brothers who are trapped in the chains of slavery. It’s hard to think about my peers who are in the process of ruining the rest of their lives. It’s hard to think about the people all across America – and the rest of the world – who don’t know about the redeeming love of Christ. And know that He is sovereign- even when I can’t see it. Well He does answers prayers… I have a loved one who has had many terrible trials and perhaps one would not think him to be a Christian … no but he was saved long ago as a kid really … and he always had a belief in Him and would turn back and pray… which reminds me of what you said Amanda how some do put out that phrase when something always goes good and says Praise the Lord… which is true … however when it becomes like rote or in a different voice… irksome sorry because it is not the persons same tone… it seems not real… sorry… just saying .. Well anyone this special someone did just get a job and I felt in side yes! Thank You God… but you know what I did not say it out loud… no it was him who said to me Thank God!!! he said… ” I prayed and prayed for this to be and He really did make it happen..” . I wonder Rachel if this will make you feel better as if no one was led by the Holy Spirit to perhaps plant this seed and show him Christ … then how could this be .. where would he be ???? Actually many many times he could of died physically on earth … and that is horrible, but since he loved Christ and believed that this is , the most important thing is that he was saved and upon death he would go home and live in his homeland really the kingdom of heaven… and that is what is most important … really that is where our citizenship is to be. So don’t give up! It works you might not see the fruition … but He does… I believe this to be… ! I feel for you, so terrible some or even I may fall away from His ways… the world is a scary place. and it is tempting to go it alone…because His ways are not our ways… so hard to understand but He said not to worry He has overcome…. and like Amanda posted on His marvelousity really in Psalm 104 … He tells the waters where to stop … imagine those big big bodies of oceans… He tells them where to stop … and I marvel as well … and it brings me comfort to know if He can do that really .. then I can rest assure and close my eyes at night at sleep soundly knowing He will take care of it all. Very, very true, Rachel! All of the many problems in the world can be very depressing and frustrating. It’s so good to know that we have a Lord that can handle it and is willing to use us to turn the tides. Thank you for this post! 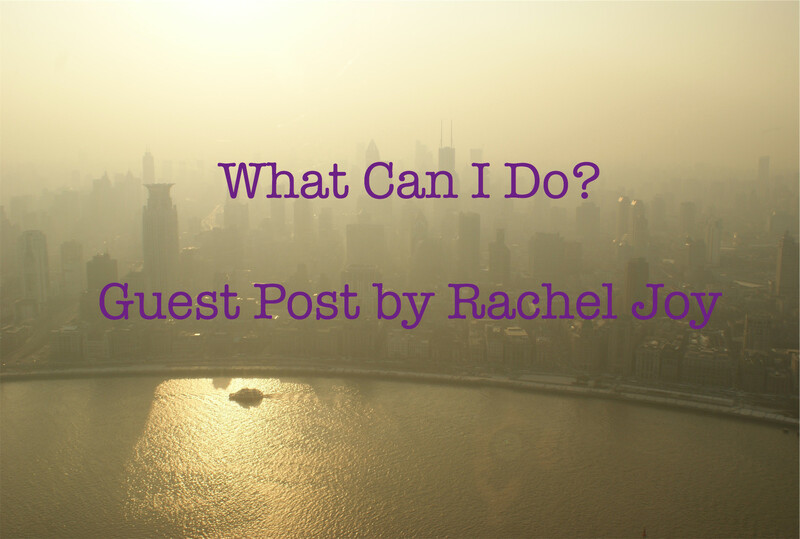 Great post Rachel. There are so many problems in the world today that we can do nothing about or can we? there must be something we can do about it. Next PostNext Book Thursdays: Cover Reveal Coming Up!